Self portrait oil painting by Mike Ivey - 16" x 20"
Oil painting portrait artist Mike Ivey is a meticulous master of realism and detail. Working from photographs, he creates precise portraits that bear an uncanny resemblance to his subjects. Sometimes they look so lifelike you almost expect them to move or wink! 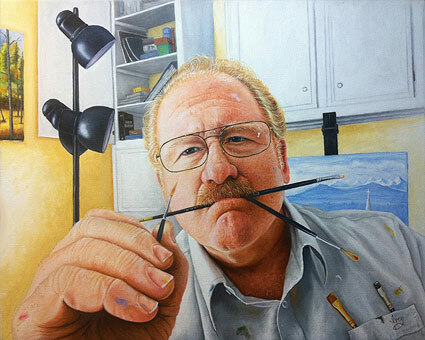 Mike is a versatile, self-taught artist who enjoys exploring realism in art. His talents extend across various media, including oil painting, colored pencils, chalk and graphite. In addition to portraits (many of which are commissions), Mike also paints landscapes, seascapes, and wildlife. I was born and lived most of my life north of the Houston, Texas area. After my wife Nancy and I were married, we lived in Missouri near the Lake of the Ozarks for a couple of years, Alpine, Texas eight and a half years and Wimberley, Texas for two years. They were all great places with beautiful places to paint. In 1989 we moved back to the Houston area. I have been drawing and painting for many years. An uncle noticed that I like to draw when I was in the fifth grade. He bought me a small oil paint set. My first painting with those oils was a portrait of Dean Martin. I can remember winning a few awards and asked to help in class and school activities with art. I doodled and drew a lot. Drawing or doodling when I should have been studying, got me in trouble often in school. Mike giving a "chalk talk"
I have always been told I was artistic, but never thought about it much until I started to sell. I just loved to draw. I have been drawing and painting for more than fifty years. I should be an artist by now, but I’m still learning. I started getting serious about my work a few years ago, especially portraits. Did you go to school for art or take lessons, or are you self-taught? I have never had any formal training in art. I have studied art that interests me as much as I could and I took a few semesters of art instruction in collage but I’m mostly self taught. I love charcoal, carbon and colored pencil, but oil is my favorite. I have dabbled in water color and acrylic and really like pastels, but I always come back to oil. Portraits have been my favorite subjects the past few years. Can you describe the basic steps you take, from start to finish, to create a work of art in oil paints? Because I do so many different subjects the process differs with each. With portraits I start with photos. Most of my portraits are from a mix of photos when possible. I like to add things to the painting that tell something about the person being portrayed, as in the painting of my wife, Nancy and one of our granddaughters, Zuri. Even the objects in the background are part of the story. The most recent work, a self portrait tells a lot about me! I use digital photos and a computer when I can to zoom in on the details and even work on the composition. 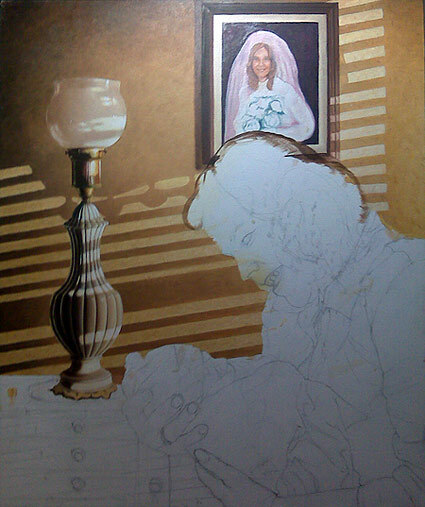 I lightly sketch on the canvas and then began to lay down some background color. Skin tones are usually thinned with an oil medium/thinner mixture in a multilayered technique. I start with the darker areas and then to the lighter. Final details come after I am sure of the shapes and positions of the objects of the face and the values are correct. This is where the fun begins, as I add the life and character through detail. 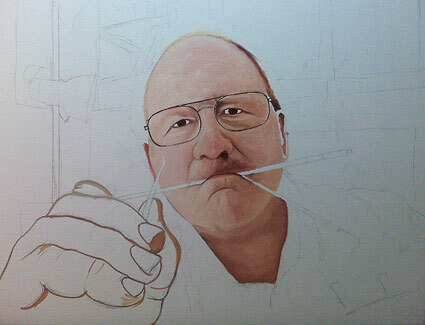 The composition is lightly sketched in and Mike lays down the skin tones. The background begins to take shape as Mike paints in the local colors. 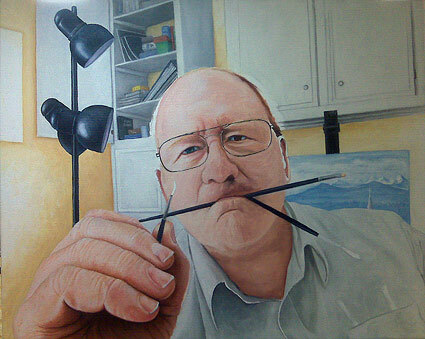 The finished self portrait oil painting, by Mike Ivey. 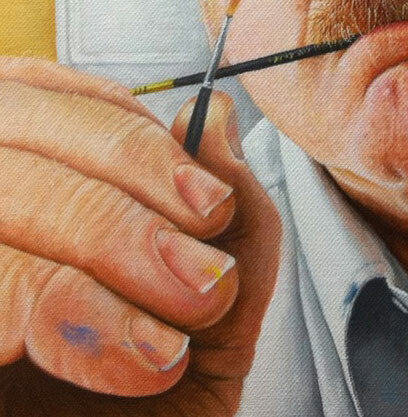 Close-up of Mike Ivey's self portrait oil painting, showing his meticulous attention to detail. Close-up of Mike Ivey's finished oil painting portrait, showing detail in the hairs and tones of the face. What are some of the challenges with working in oils? There are many challenges but most of them are what motivates me; like the mixing of colors and choosing the right brushes and making them do what needs to be done. At this point in my art every portrait seems to have something in it that is a new challenge to figure out. I love oils because they are very forgiving! If I mess up, I just scrape it off or paint over it. There are specific challenges to photorealism. For me it was a matter of what I enjoy, and I love detail! It doesn’t matter to me that it takes many hours to complete a project. I get into detail! The recent portrait of my wife took over 50 hours, and I loved every minute of it. I’m not greatly concerned to express myself in art as much as I enjoy the challenge of taking the tools of art (brush, paint and canvas), and seeing how close I can get to the original creation of the Artist Himself. If I try to create anything it is the mood or atmosphere of the painting. To me the beauty is in what I see, not what I imagine…. What is your favorite subject matter to paint? My favorite subject matter is people, children, the elderly, the silent faces that speak with their eyes and expressions. I also love to do wildlife, landscapes and seascapes and anything that sparks my interest. Do you work from photographs or from real life, and why? Photorealism is difficult from real life. I enjoy taking photographs and finding parts and pieces to use in a painting. The digital photo is great to zoom in close on a computer. When I paint an eye, I zoom in to get the detail. 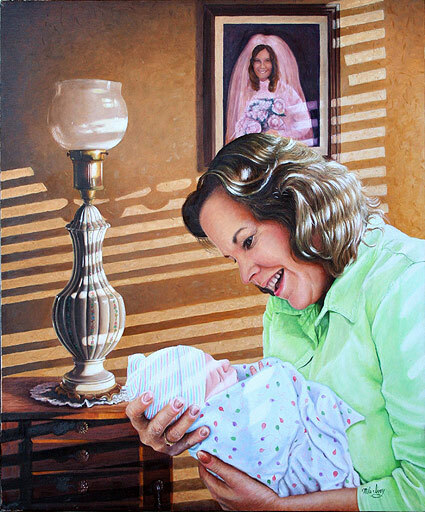 The portrait of my wife and granddaughter was done from a photo taken in the hospital room two years ago in Waco, Texas. 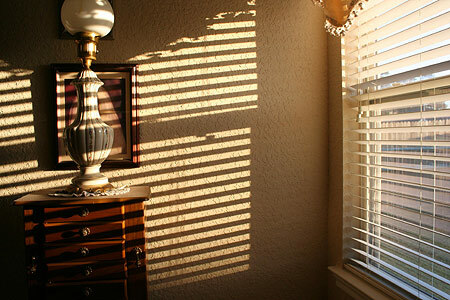 I liked the way the sun came through the window blinds behind them. I woke up one morning months later and to see the sun pattern on the wall in our bedroom. I added my wife’s wedding picture and an antique lamp my mother left me. Below you can see a close-up of the praying dog in Mike's oil painting portrait titled "Bedtime Prayers". The painting is 16" x 20". Close-up of Mike Ivey's oil painting portrait, Bedtime Prayers, showing the detail in the dog's fur. Now let's follow the steps Mike took to create this oil painting portrait of his wife and granddaughter. Notice how he combines two photos to create his painting. This a 20” by 24” oil on canvas of my wife and our granddaughter Zuri. The hospital photo was taken at the birth of our granddaughter. I liked the way the light came through the blinds and fell on them both. One morning I saw the same pattern on our bedroom wall. I took many photos to get the right shot for the background. The lamp in the background is a lamp my mother left me and the photo in the background of the background is my wife’s wedding picture. It took over 50 hours over 4 months to complete. 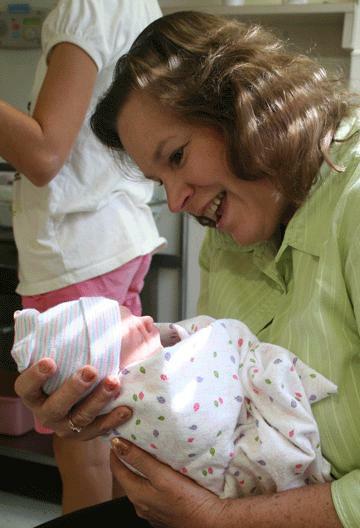 Photo of Mike's wife holding their newborn granddaughter at the hospital. This is a photo Mike took at home of the lights filtering through the blinds. Mike combines the two photos to create his composition, which is lightly sketched onto the canvas. He starts by painting in the background. Mike starts filling in the skin tones on his wife and grandchild. Mike adds more detail on his wife's hair, her shirt, and the baby's cap and blanket. Finished 20" x 24" oil painting portrait by Mike Ivey. What artists do you admire, and why? There are so many artists from the past and in the present that I find myself admiring and studying. I started making a list for this question and it got very long. I research a lot on the internet. I’m always trying to discover how they did that! I’ve been a fan of Norman Rockwell since childhood! I still go back and study his work. I like people, and I enjoy painting with people watching. To be perfectly honest I also like the comments offered and talking about art. Mostly, I just love to draw and paint! I love the satisfaction of stepping back seeing a work finished. 11" x 14" pencil drawing of Mike's grandparents on their wedding day. 11" x 14" pencil drawing of Mike's grandparents on their 50th wedding anniversary. Do you have any advice for aspiring artists who would like to improve their skills? The best advice I ever heard; “practice, practice, practice”. I believe it’s important to study other artist and their work. It has been very beneficial to me to find mediums and style that I love. Love what you do or you’ll not be it doing long. You can more of Mike Ivey's oil painting portrait art at his website, www.mikeiveyart.com, where you can also see his colored pencil artwork, his graphite drawings, and his landscapes. Would you like Mike to paint or draw a portrait for you? Mike welcomes all commissions, which he can draw or paint from your own photographs. Contact him at mikeiveyart@aol.com if you are interested in commissioning a custom portrait. 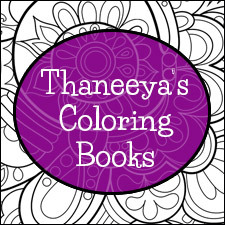 He'll be happy to work with you to create your own custom painting or drawing. 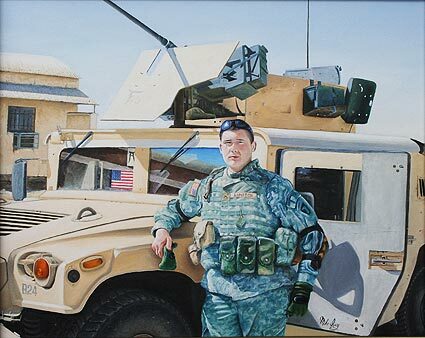 16” by 20” oil painting portrait on canvas of a soldier in Iran next to his Hummer. It was done from photos taken in Iran.